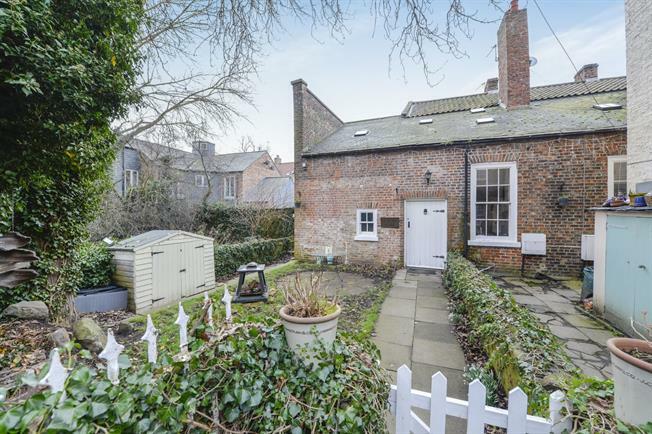 2 Bedroom Semi Detached Cottage For Sale in Yarm for Asking Price £240,000. A delightful room with high ceilings and a stunning iron spiral staircase leading to the first floor, and step down into the dining room. Range of cream wall and base units with solid wood work surfaces. Original wooden entrance door and sash window to the side. Wood flooring. Radiator. Doors leading to the lounge and bathroom. Light and bright, with double doors to the rear. Beamed ceiling with spotlights. Wood flooring. Radiator. An elegant room with two sash windows to the front with wooden shutters and stripped pine doors. Open fireplace containing a wood burning effect gas fire with slate hearth creating a warm and cosy feel. Exposed brick feature wall. Laminate flooring. A stripped pine door leads into the spacious bathroom which has a white suite comprising of a panelled bath with shower attachment, pedestal sink and WC. Heated towel rail and radiator. Beamed ceiling. Two windows to the side. Tiled floor and part tiled walls. Cosy and inviting, the master bedroom has a vaulted ceiling and skylight window. One wall features exposed brick, and there is a beamed ceiling with spotlights. Double built in wardrobe and storage cupboard.. Radiator. With a skylight window and further window to the side. Beamed ceiling with spotlights. Two double built in wardrobes. White suite comprising of a step in shower cubicle, wall mounted wash hand basin and WC. Beamed ceiling with skylight window. Spotlights and radiator. A fabulous spiral staircase with wooden steps and iron banister takes you from the kitchen to the landing, which has a sky light window, and an exposed brick wall. Radiator. Spotlights. Access to both bedrooms and the shower room. The charming garden to the front has an area laid to lawn, with a picket fence and gated entry, and path leading to the front door. An ancient wall acts as the boundary, and provides an attractive feature. Paved area to the side of the house with a wooden shed and further seating area.